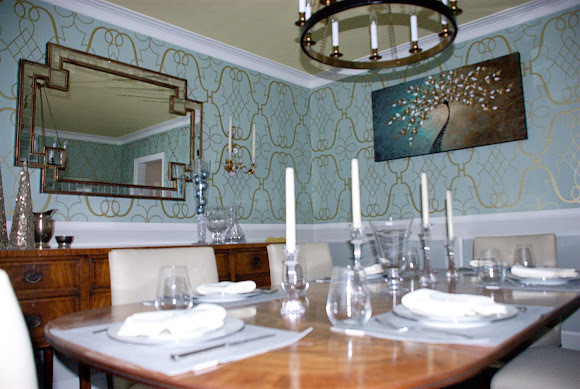 Many of you were quite interested in what Geeta really thought of her dining room and her experience on Sarah 101. While Geeta wasn't entirely happy with the chairs and artwork that were featured on the show, she was really happy with the replacement chairs that Sarah helped her pick out and the artwork she purchased on etsy. Much more livable, I think, don't you? 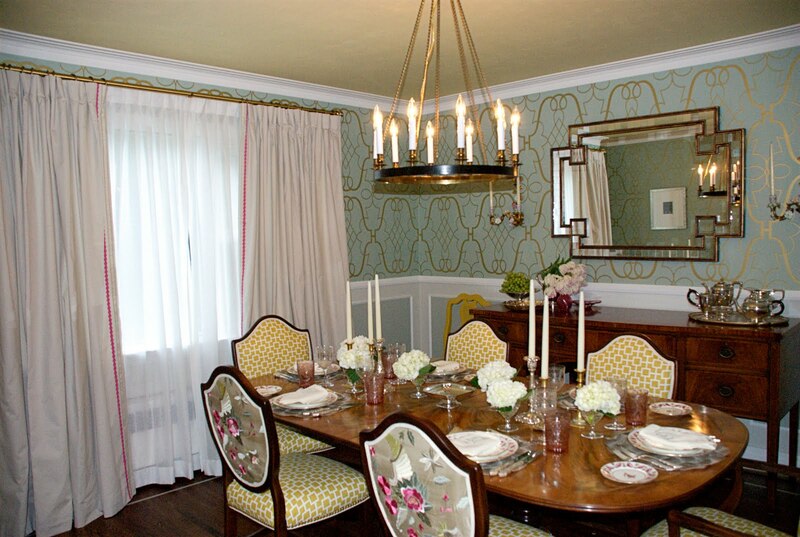 The chairs are the Cole chairs from Sarah's own line and feature a nice subtle pattern and nailhead trim at the legs. The artwork picks up on the colours in the room (though it is hung a little high because Geeta just temporarily reused the nail that the floral art was hung on!). And with the table set with more modern dishware, the whole room takes on a younger, more classic vibe than it appeared on the show. I hope you've enjoyed this sneak peek behind Sarah 101. Thanks for sharing Geeta & Jerry! Its good to know that sometimes the happy homeowners we see on TV really are happy. I think the before chairs were a little much but the colour was great. I think the new chairs are a tiny bit bland for the room. Maybe same style but in a more lively fabric? End of the day though if the home owner is happy, all's well! Someone should just donate the original chairs to me. I'll put one in every room of my house, that's how much I love them. I do love the new artwork, so pretty! I loved the original chairs and according to Sarah herself a week ago on FB, those orginal chairs are still available if you want them! 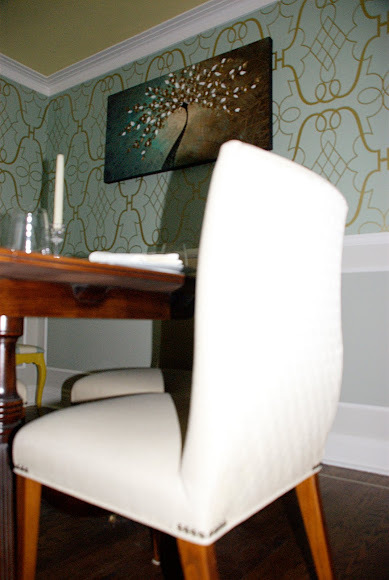 looking at the new set of chairs in this dining room and the new art work, I do agree that maybe this is a better mix of "old" and "new" in the room. The before certainly has a more traditional sensibility and now the "after" is more current and more of what Geeta and Jerry like. Thanks again for the update! Your room is still my favourite episode so far! I like the mix of old and new as well, they added their personal touch to the room so I am sure it will feel much more comfortable. However, I feel like the art work is hung too high on the wall and should be lowered, it looks out of place. Beautiful. Love the new chairs. Much more livable. Love it! I think this is much more liveable, which is important!! I agree that the artwork really needs to be hung lower, it's too high right now. Centred between the crown molding and chair rail would look much better. I much prefer the new chairs. Really is a pretty room. This room is gorgeous! I love the chairs, love the nailhead detail. But, please-please-please lower that artwork! It makes my head hurt... ;o) D.
I absolutely love that wallpaper. The new chairs are very calm and pretty and easy to live with. It looks like a dining room that will be a great place for family dinner, entertaining, and making memories. Fascinating - thanks so much for sharing! I wish I could see the show here in the US. 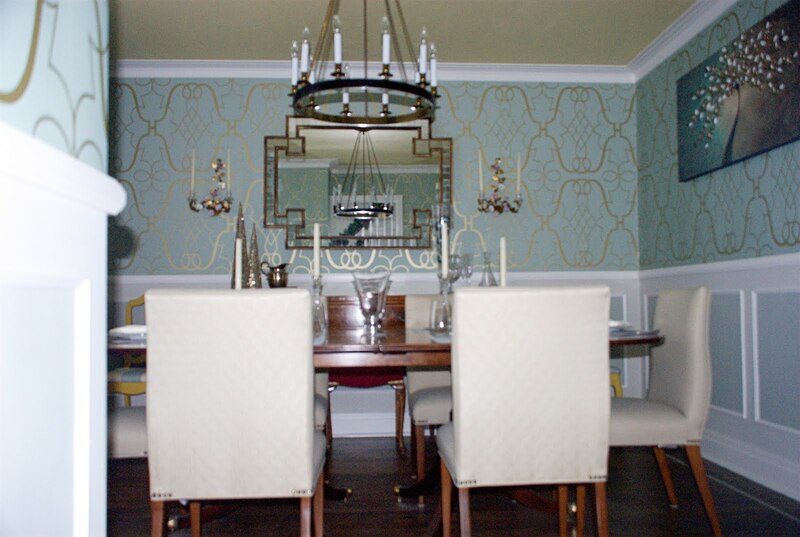 I have to get by with pics on hgtv.ca! Can't believe they didn't like the chairs! They were so inspiring for me - LOVED the idea of having a different pattern on the back. I'll be doing that soon for SURE.